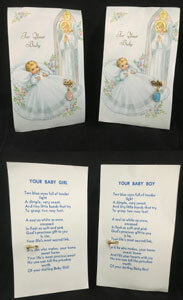 BROWN SCAPULAR WITH COLOR PICTURES - Low price so you can keep some on hand as the children need them. We use the brown cord for the men and the boys. approximately 1.5" x 1" - wool is a little larger. 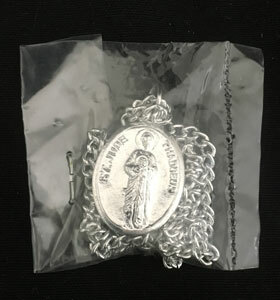 This 16" Chain with Brown Beads contains pictures of the seven sorrows of our blessed Mother with a picture of our sorrowful mother on the reverse side. Beautiful for meditation on the sorrows of our blessed Mother especially during September and lent. 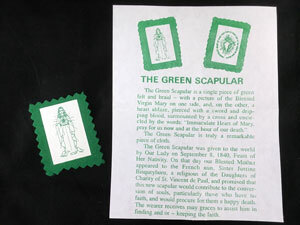 The devotion of the sacramental of the green scapular is especially used for conversions and is greatly needed today. 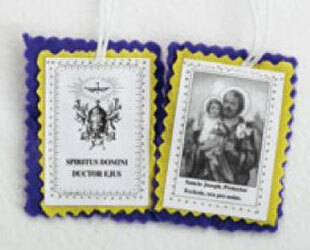 This scapular does not come with a cord. 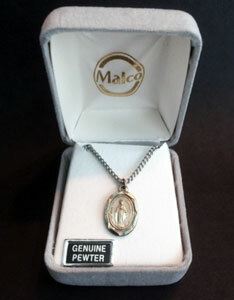 This can be place under a pillow; with a picture of the person you are praying for; in a wallet or purse; or in a pocket. 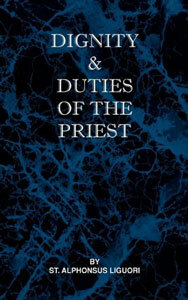 It includes a leaflet explaining the history of the devotion. 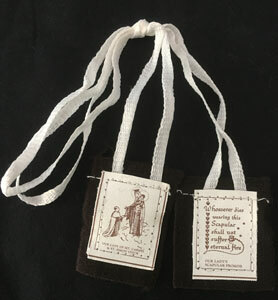 The devotion of the sacramental of the green scapular is especially used for conversions and is greatly needed today. 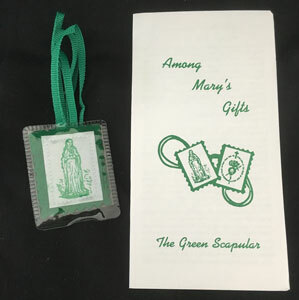 This scapular is encased in plastic and is on a green cord. 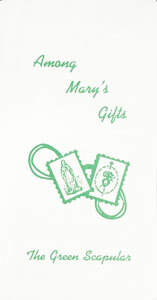 It includes a leaflet "Among Mary's Gifts" explaining the history of the devotion. 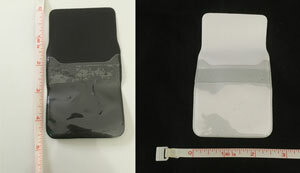 approximately 3/4" silver color. Chain with clasp approximately 17" long. 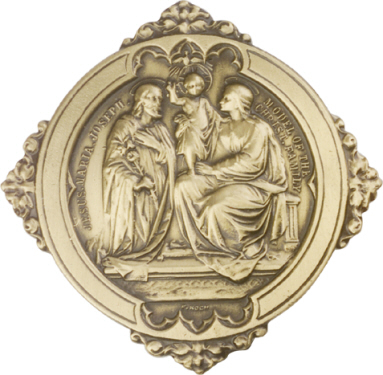 Medal - Gold Plated - Christian Mother/St Joseph - 1.5"x1.875"
This large medal would make a beautiful gift for a Christian Mother Guild member. 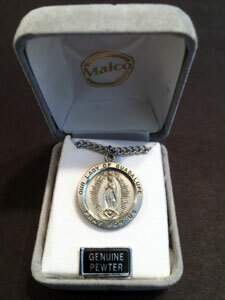 St. Joseph side reads "St. Joseph powerful intercessor pray for us and our children" Sorrowful Mother side reads " Most Sorrowful Heart of Mary, have pity on us and our children"
Miraculous Medal - 1/4" Medal with bangle pin approximately 3/4" choose below for boy or girl. approximately 1" silver color. 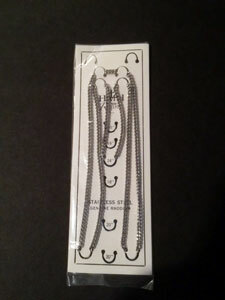 Chain is continuous and approximately 24" long. approximately 1/2" oval pewter. Chain is approximately 17" long. approximately 7/8" round pewter. Chain measures approximately 24" long. 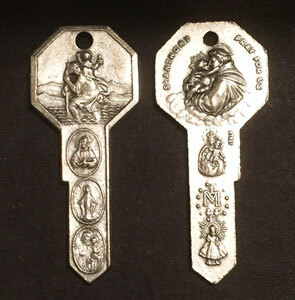 Medal - Saints Key 2"
approximately 2" high medal Saints included: St. Christopher Sacred Heart Miraculous Medal St. Joseph St. Anthony Our Lady of Mount Carmel (Scapular) Infant of Prague Image shows front and back of medal. 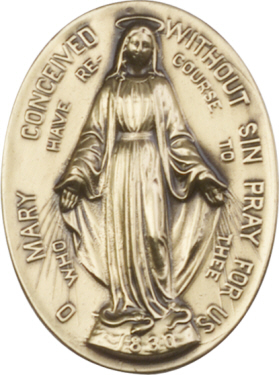 approximately 1/2" high medal -- Pope St. Pius X established the Association of the Miraculous Medal to "render due honor to Mary Immaculate, first by sanctifying ourselves, and second by contributing to the sanctification of our neighbor by means of this Medal." 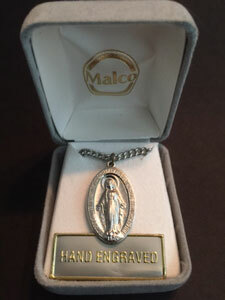 Can be worn with the Scapular, placed on a rosary, placed by windows, . . . 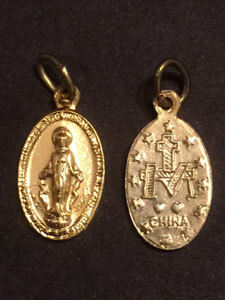 Image shows front and back of medal. 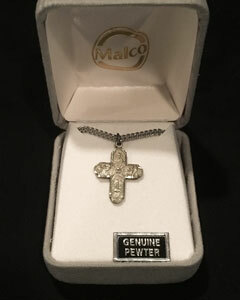 2" high medal PARDON CRUCIFIX includes explanations of indulgences granted by His Holiness, Pope St. Pius X to the Pius Union of the Pardon Crucifix. 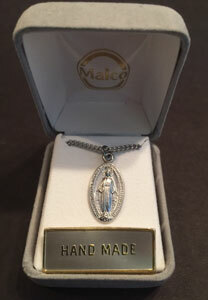 Beautiful Crucifix to wear or place on your rosary or chain. 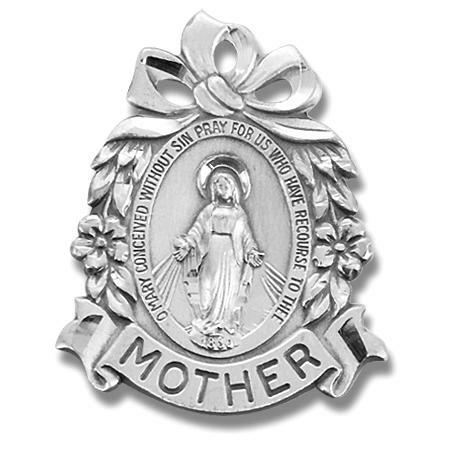 This badge is in a clear plastic case and may be carryed in a pocket or rosary case or placed on a chain. Please note the difference between this badge and the requirements for the indulged badge listed on the Sacred Heart Scapular/Badge. NEW TWIST DESIGN! Our St. Philomena Cord is now more deluxe! 100% Cotton, red and white cord to be worn around the waist. Comes with a leaflet describing this devotion to St. Philomena. 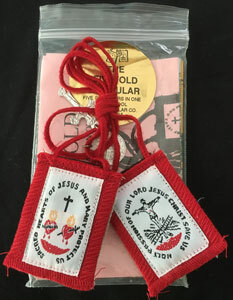 In a rescript dated June 25, 1847, Pope Pius IX gave his approval to a new red scapular called "The Scapular of the Passion of our Lord and of the Sacred Hearts of Jesus and Mary." 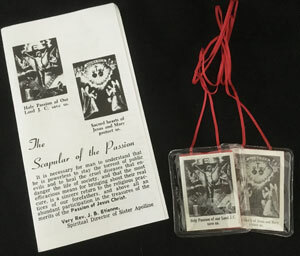 Includes scapular and leaflet explaining the history of the scapular.